5 | 2015 : Varia e dossier temático: "Ciência e arte, SciArt: museus, laboratórios, cientistas e artistas"
Due to the costs involved with renovating exhibitions at natural history museums, some permanent exhibits stay on display unchanged for decades. The Bone Hall at the Smithsonian’s National Museum of Natural History has remained intact for 51 years. Here we discuss this exhibition as a stark exemplification of a science-only, art-free approach to communicating ideas and how creative reimaginings of the visitor experience have made it more accessible for the majority of visitors. Within the Bone Hall, mounted skeletons are displayed in static poses without any hint of movement and interpretation of their behaviors and text labels describe, in esoteric language, skeletal details. In a rare opportunity to redesign the visitor experience for an existing exhibition, we produced a mobile app. The app is guided by concepts in the natural sciences, yet inspired by artistic ideas applied to audio, video and 3D animation, which created a multisensory visitor experience. Indispensable to the approach was a production team comprised of individuals rooted in the arts/humanities and sciences. They used their crafts to make science more accessible to non-specialized visitors through audio/visual creations. Interviews and surveys with visitors confirmed the value of producing artistic interpretations of science as a more effective method of communication in the exhibit. Os custos inerentes à remodelação de exposições permanentes em museus de história natural levam a que algumas permaneçam inalteradas durante décadas. A Galeria dos Ossos (Bone Hall) do Museu Nacional de História Natural do Instituto Smithsonian, em Washington D.C. nos Estados Unidos, está intacta há 51 anos. Neste artigo analisamos a maneira como a exposição comunica ideias de uma forma exclusivamente científica e como a sua reinterpretação artística digital a tornou mais acessível para a maioria dos visitantes. A Galeria dos Ossos exibe esqueletos em poses estáticas sem sugestão de movimento ou interpretação do seu comportamento, e painéis de texto com descrições detalhadas em linguagem técnica. Os autores tiveram uma oportunidade rara de desenvolver uma aplicação móvel com vista a alterar a experiência unidimensional dos visitantes. A aplicação é baseada em conceitos das ciências naturais, mas inspirada em ideias artísticas que influenciaram o áudio, vídeo e animação na aplicação, com o objetivo de proporcionar uma experiência multissensorial aos visitantes. Fundamental para a sua concretização foi a equipa de produção composta por elementos com formação nas artes/humanidades e ciência. O trabalho audiovisual dos artistas tornou a ciência mais acessível para os visitantes e revelou-se uma forma mais eficaz de comunicação na exposição, o que foi confirmado através de entrevistas e questionários. 1During the time of the Cold War and the post-Sputnik Space Race, when Western and Eastern Bloc countries were vying for technological superiority, British intellectual, novelist, chemist, physicist and politician Charles Percy Snow delivered a lecture on The Two Cultures (Snow 1959). For Snow, the two cultures were the humanities and sciences and he concluded on how little exchange there was between them and how many scientists had never read Charles Dickens, while many other intelligent people could not describe the Second Law of Thermodynamics. Snow depicted a British populace educated in the humanities but illiterate in the sciences, which he thought would lead to a country ill prepared for technological challenges and economic competitiveness. Snow drew attention to the education systems in Germany and the United States, which he claimed balanced the sciences and humanities, and would lead to their economic superiority. Whether Snow overstated the imbalance of the two cultures in the UK and their equilibrium in the U.S.A., three trends underpin the continued separation of the two cultures in the U.S.A. today – most students entering postsecondary institutions require remediation in math and science; only a minor segment pursues degrees in science, mathematics, engineering or technology (STEM) (Science and Engineering Indicators 2012; The Nation's Report Card 2013); and once in college, 40%-60% of students that choose STEM degrees switch fields to non-STEM areas of study. 2The relevance of this depiction of the two cultures bears on the challenge informal science education organizations, such as natural history museums, have to bridge the gap between the two cultures; or to phrase this in a more contemporary way, to connect those with weak science identities to science. One approach is to exhibit art inspired by science, art that is not a literal translation of scientific concepts, but which provokes thought and interest around those concepts, the scientific methods and processes. Such programs have been developed that foster collaborations between artists and scientists to produce work that influences the public’s general engagement with science and create a critical mass of artists active in this genre (see for example the Wellcome Trust’s Sciart programme – Glinkowski and Bamford 2009). Science museums have embraced some artists’ works by both displaying their work as temporary exhibits and acquiring them to become part of the permanent collection. One example is the Crochet Coral Reef project that has been exhibited in science and art museums, galleries and universities (Wertheim and Wertheim 2015), another is The Bright Beneath, a temporary exhibit by artist Shih Chieh Huang that resulted from his experience as a Smithsonian Artist Research Fellow (Tennessen 2014). 3Although works of art inspired by science expose the public to the intellectual threads of science, the artworks themselves do not address the science literacy challenge of the majority culture. One way to address the problem is to invite artists to represent scientific concepts through their craft, exploring their creativity and heightened capacity of communication bounded by the reality of the natural world and scientific exactness. This situates art in the service of science to make science more accessible to those with marginal science identities. 4At the Smithsonian’s National Museum of Natural History we had the opportunity to provide visitors with two very different experiences within the same exhibition. The exhibition is known as the Bone Hall and it is a taxonomic parade of mounted skeletons representing the major groups of vertebrates. From the perspective of the two cultures, the exhibition is notable for the stark exemplification of a science-only approach to communicating ideas. As the idiom goes in English, the ink had hardly dried on C. P. Snow’s published lecture when work began on the Bone Hall in the early 1960s, so it should not surprise anyone that there are no references to the arts and humanities in the exhibition, no murals or playful interpretations through graphic visualizations, or even textual metaphors. The pendulum had swung hard toward STEM in the U.S.A. with the promise from president J. F. Kennedy (Kennedy 1961) to put a man on the moon before the end of the decade. 5Today the Bone Hall remains exactly as it was when installed in the 60s. The austere science communication in that exhibition influenced our presumption that science could be more effectively communicated by employing visual and narrative creativity and by giving artists license to be imaginative with their crafts. The tool of change was a mobile app. 6The Bone Hall, also known as Osteology Hall, is an exhibition space at the Smithsonian’s National Museum of Natural History in Washington, D.C. In a sequence of five connecting rooms with walls lined with glass display cases, 279 full skeletons and skeletal parts representing all living groups of vertebrates are seen by several million visitors each year. 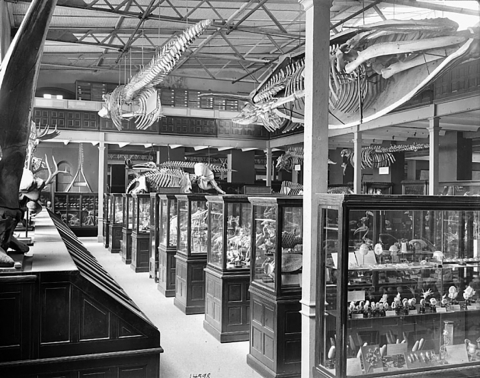 7Many specimens in the Hall come from the 19th century collecting efforts for the Paleontology and Comparative Anatomy exhibit, which opened inside the United States National Museum (USNM) in 1881 (fig. 1). Fig. 1 – Paleontology and Comparative Anatomy exhibit, c. 1900. United States National Museum. 8Soon after the USNM opened, collections outgrew storage capacity and a new building was planned and construction was completed in 1911. Today, the building is home to the National Museum of Natural History (NMNH). The skeletons in the Paleontology and Comparative Anatomy exhibit were transferred and reorganized – the fossil animals and plants were placed into a paleontology hall and many of the modern vertebrate skeletons went into a comparative anatomy exhibit. The collection of skeletons was once again rearranged in the 60s, - following a major exhibit modernization program - that display is the Bone Hall 51 years later (Yochelson and Jarrett 1985). Many of these skeletons are thus the oldest on display at the Smithsonian Institution. 9The redesign of the osteology exhibit in the 1960s was led by individual scientists or small teams specialized on the five vertebrate classes. They were responsible for most of the process, from selecting the objects to writing the labels. Overall the exhibit was planned to convey comparative anatomy and classification through direct observations of skeletal structures (fig. 2). It reflects a similarity to other large comparative anatomy collections such as the Museum of Comparative Zoology in Harvard, which in turn were inspired by European collections like the Grant Museum of Zoology in London. These exhibits began as a combination of study/teaching collections and cabinets of curiosities, and are now on view for general museum audiences. They retain their initial educational potential and are still used by scientists and their students today for teaching and learning concepts of evolution and comparative anatomy, and by artists that appreciate the aesthetic appeal of the stark bones, the vast range in scale from whale to shrew and the intricacies of skeletons. Fig. 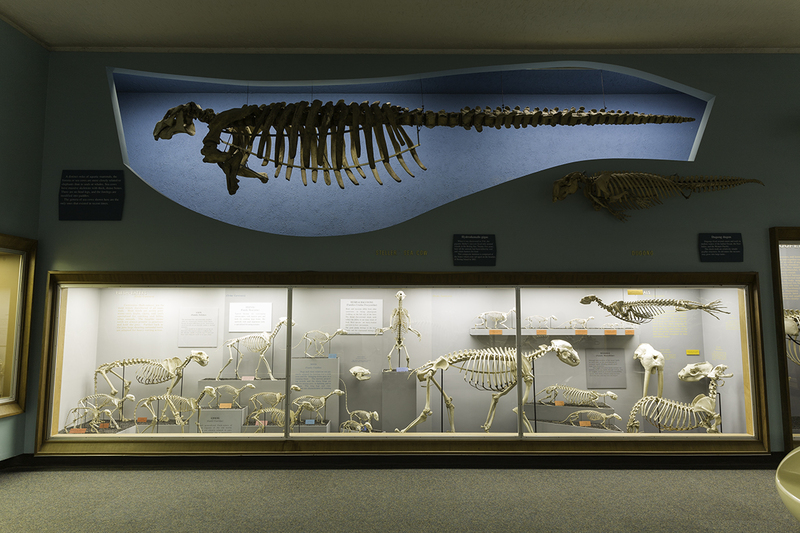 2 – Flesh Eaters and Seals display case, with Steller’s Sea Cow and Dugong skeletons above, 2008. Bone Hall, Smithsonian’s National Museum of Natural History. 10However, for the unspecialized visitor, a tour of these osteological collections is unlike the experience provided by modern science exhibitions, and it does not meet the current expectations for narrative, visual interest, information and interaction. In fact, this is a broader manifestation of the curatorial interpretation of objects that does not seem to be sufficient to engage 21st century visitors (Hein 2000). The modern view of museums as public institutions valuing visitors’ involvement has placed more emphasis on artistic, interactive and participatory experiences and less on the didactic meaning of objects. In addition, research focused on educational benefits of skeleton exhibits in natural history museums and zoos has revealed that some type of scaffolding, with highlights on the components of skeletons and their functions, is advisable, since the information visitors extract from observing a skeleton is usually limited to animal identification and occasionally a simplified view of their environment (Tunnicliffe 1998; Tunnicliffe and Scott 2003). 11The Bone Hall displays skeletons accompanied only by labels with species identification and text panels describing diagnostic skeletal features. The skeletons are nearly all mounted in perfectly still poses without representing any particular behaviors such as feeding, fighting, or giving the impression of motion. The panels are large and often occupy a central position in the case, displacing the skeletons to the sides. The texts are long and scholarly, include specialized anatomical terminology and they infer evolutionary concepts. Specimen labels are inconsistently displayed and some are located on side walls or lay flat on case floors and are hard to find. Other than a few images that were added in the decades following the opening of the exhibition, it lacks any expressive representation of ideas. The effect is largely a science-centered display unattainable in its full potential by the unspecialized visitor. Not surprisingly the majority of the visitors walk through the Hall making very few, very brief stops; some of the larger specimens – like the two meter long swordfish or five meter long grey whale – seem to function as attractants and photo opportunities, as do skeletons that visitors relate to for being familiar to them – like the American Bison or Blue Catfish. Ironically, concepts in anatomy and evolution underpinning the exhibition design are lost to visitors. 12Given the historical and biological importance of the Bone Hall there is an institutional reluctance to physically modernize the exhibit. The time and resources required to redisplay and reinterpret nearly 300 skeletons has in effect propelled Victorian age displays, reworked in the 60s, into the 21st century. Therefore, in the fall of 2012 the addition of a digital experience to the Bone Hall was initiated with the intent of increasing the enjoyment and memorableness of the exhibition for visitors, and to improve the communication of the main organizing principles of the Hall. It entailed the development of Skin & Bones, a dedicated mobile app for visitors’ handheld devices (smartphones and tablets with iOS operating systems). The app was released in January 2015 and can be downloaded for free on the App Store. Unlike the exhibition design that thinly treats higher-level taxonomic groups, the mobile app dives deep into lower level taxa and the more general biological ideas associated with them. 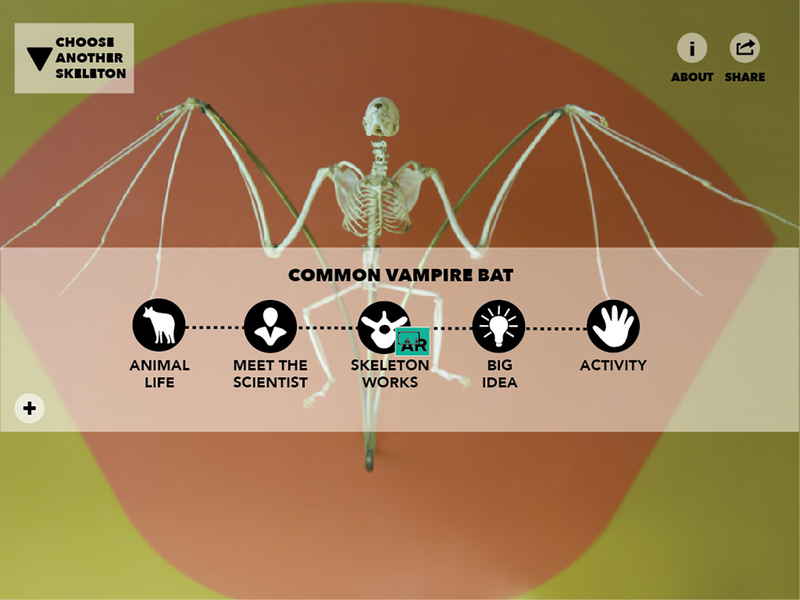 The mobile app can be used to learn more about thirteen of the species on display – Common Vampire Bat, American Bison, Mandrill, Steller’s Sea Cow, Baird’s Tapir, Pileated Woodpecker, Brown Kiwi, Anhinga, South American Bullfrog, Eastern Box Turtle, Eastern Diamondback Rattlesnake, Blue Catfish and Swordfish. 13The choice of mobile technology as a solution to the Bone Hall is supported by being ubiquitous and familiar to visitors, and capable of offering personal and relevant experiences (Kahr-Højland 2006). Even though mobile devices have been part of the museum landscape for a long time, mostly in the form of audio tours, mobile is now the subject of renewed attention (Katz, LaBar, and Lynch 2011; Proctor 2012), and is part of the digital strategy for the Smithsonian Institution (Clough 2014). Within this new emphasis on mobile, museums are also exploring associated technologies such as augmented reality as an innovative medium (Schavemaker 2012) where exposure to an object and its interpretation can merge and generate a singular, integrated experience (Elinich and Snyder 2010). Essentially, augmented reality can eliminate the visitor decision on whether to read a label or not. 14In the Skin & Bones app there are ten augmented reality experiences featuring static and animated 3D computer graphics, 32 videos, and four activities. It is the first mobile app to feature this many 3D augmented reality pieces for an exhibition. The content of the app can be enjoyed anywhere in the world except for the AR experiences that can only be triggered in the Bone Hall. Here the multisensory visitor experience exists alongside the half-century old physical exhibition. Visitors can opt for the 1964 experience, the 2015 experience, or both; but it is the digital layer that carries the messages in a more artistic, accessible and engaging way. 15The creative pieces in Skin & Bones were developed under the theory of experience preferences known as IPOP (Pekarik et al. 2014), which asserts visitor typologies fall into four categories for experience preferences: I=ideas, P=people, O=objects, and P=physical. We added a new category that we refer to as ‘Animal’ experiences, which fits the context of an exhibition in a museum of natural history that features animals. “Big Idea” videos explore scientific concepts that are associated with the animals in the exhibit and add new ideas on biogeography, echolocation, metamorphosis, resource partitioning, visual signaling and venom. “Meet the Scientist” videos introduce Smithsonian scientists from their more humanistic sides through their personal experiences. “Animal Life” videos present the roles the animals play in the environment. “Skeleton Works” uses augmented reality to showcase unique anatomical features; and “Activities” use haptic interactions with the mobile device to enable physical experiences (fig. 3). Fig. 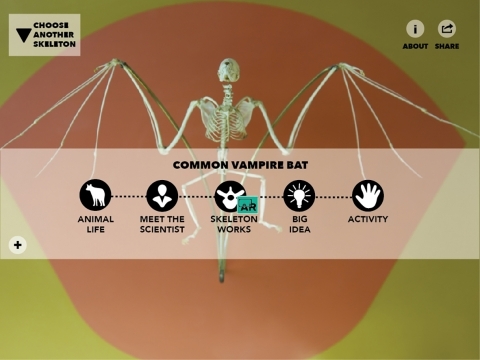 3 – iPad screen capture of Vampire Bat main page on Skin & Bones mobile app, 2014. 16Through Skin & Bones artistic expression is introduced to the Bone Hall displays. Achieving the emphasis on artistically communicating science, the production team included a diverse group of experts on artistic multimedia production, plus a science educator and vertebrate researchers. The artists involved are specialized in 3D graphics and animation, audio and video production, and although part of the team has no formal training in science, one of the 3D graphic artists is a scientific illustrator with a degree in biology and one of the video producers has a degree in biology. 17All audio/video content in Skin & Bones began with scripts written by the science educator (with a background in design). The short texts, up to 300 words, were the framework for the creative audio mixes, video animations and 3D animations produced by the artists. There was little collective brainstorming or group storyboarding of the audio/visual aspects to the narratives, which left each artist to make creative decisions and execute them based on the inspiration gained from the stories and the animals themselves. 18Once each script was finished, the audio producer and a voice actor recorded the text in the Bone Hall, which was the base material for later sound mixing. Each final audio piece is a masterful combination of the reading of the script with environmental sounds and audio effects capable of transporting the listener from the physical space of the exhibition into the Congo rain forest where mandrills live or to the oceanic realm of swordfishes. 19The audio pieces became the starting point to the augmented reality animations and videos, created respectively by the 3D graphic artists and video artists. These professionals were entirely free to interpret the text and audio without any rules to follow in the making of the visual pieces other than being grounded in reality rather than fantasy. Like any other production, cost limits impose a different set of restrictions. Most supporting imagery had to be registered under Creative Commons licenses (CC BY, CC BY-SA, CC BY-NC or CC BY-NC-SA) (Creative Commons 2014). 20The augmented reality experiences consist of both static and animated 3D models that represent the external anatomy of the animals or highlight particularities of functional anatomy. These 3D models are superimposed onto the featured skeletons through the camera on mobile devices. The artists began developing the 3D models through a variety of digitization techniques - CT scanning, micro-CT scanning, optical scanning, laser scanning, photogrammetry, and built some models from scratch using commercially available software packages. The rattlesnake’s skull is like a machine made from jointed bones. Turn it on and the fangs move into position for a strike. As the snake begins a strike, joints rotate, bones spread apart and the fangs hinge forward. Even the nose bones rotate out of the way. Muscles squeeze the venom glands and venom passes down the hollow fangs to the prey. Rattlesnakes deliver just the right amount to kill and if they deliver too little venom on the first strike they know to strike again to finish the job. (…) The mechanism for injecting venom is most highly developed in the family Viperidae. The canal for the transmission of venom is closed and the bone bearing the large fang is hinged. The fang is folded back along the upper jaw except when striking. Pileated Woodpeckers are specialists at drilling holes in trees and probing for food with their long tongues. Their tongues are powered by muscles that attach to a long, thin bone. This bone inserts into one of the nostrils on the face; then it wraps all the way around the skull until it reaches the tip of the tongue. This thin and flexible bone is called the hyoid; it is protected inside a lubricated casing, like the brake cable on a bicycle. As muscles pull on the casing, the bone propels the tongue forward to probe for food. Other muscles can retract the bone and tongue. These two movements can happen extremely rapidly. Among birds, woodpecker tongues are in a class all their own. 24In an abridged and less comprehensible way, the text panel in the case reads: “(…) Woodpeckers have long hyoid bones which permit the tongue to penetrate the tunnels of boring and burrowing insects” (incidentally, the hyoid bone is missing on the skeleton in the case). Fig. 4 – Pileated Woodpecker Skeleton Works augmented reality animation playing in front of Terrestrial Birds display case; below, sequence of four animation frames captured in the Skin & Bones interface. 2015. Bone Hall, Smithsonian’s National Museum of Natural History. 25Despite the restraint to use open licensed assets only, video artists succeeded in creating captivating and accessible pieces that contribute greatly toward the goal of communicating science in the Bone Hall more successfully. The videos are short (average duration of two minutes) and playful, combining photographs, video footage and 2D animations that create unexpected comical moments yet help users grasp complex ideas. 26In one of the Big Idea videos, the concept of scaling is explored using the Brown Kiwi as an example. These animals have the largest egg in proportion to the mother’s body weight of any bird in the world. Yet it is still unknown how this evolved – from smaller birds increasing egg size or from larger ancestors reducing body size – and the scientific community argues over these two alternative views. The script lays down the ideas in a concise and clear way; yet, the animated visualization is indispensable not only for comparison of body and egg sizes, but also to assist with the contrast between the two scientific views (fig. 5). In the display case of the Brown Kiwi in the Bone Hall there is no text panel and no egg to stimulate thought on the evolutionary processes driving the unique development of the species. Fig. 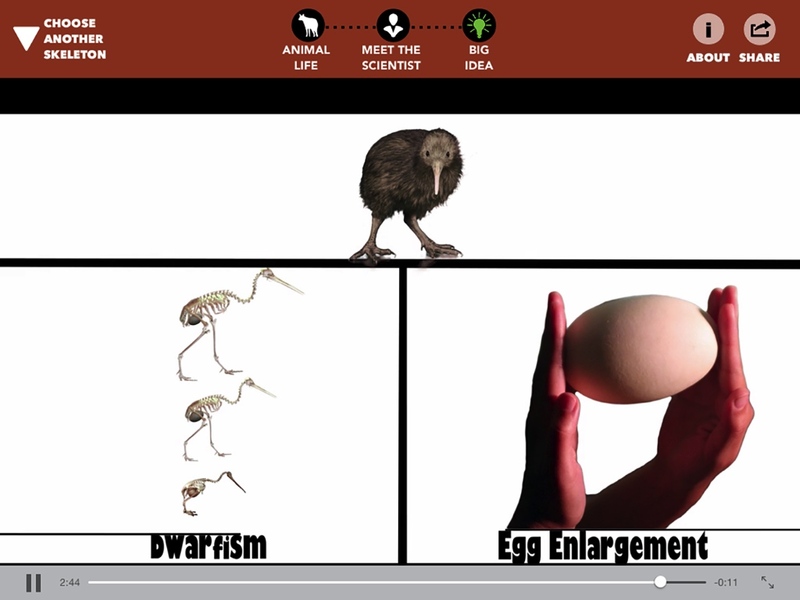 5 – iPad screen capture of Brown Kiwi Big Idea video on Skin & Bones mobile app, 2014. 27Once the augmented reality content and videos were completed, the science educator and museum curators reviewed them for accuracy. The correctness of all content must be validated by experts given the image of the museum as an authoritative source of information. The reviewers working together with the artists guaranteed that all images and sounds of organisms and environments portrayed were accurate and consistent from a scientific point of view, and checked for anatomical and functional exactness. Artistic decisions were nearly always approved with only a few exceptions that replaced images in the videos or tweaked a 3D representation of functional anatomy. On the other hand, the visual interpretation of some scripts exposed minor flaws in the scientific text, creating the need to correct scripts. 28From March to August of 2015, a study was conducted in the Bone Hall to look at visitor experiences with Skin & Bones. Potential participants in the study were selected among visitors that entered the exhibit by themselves or in small groups (up to five people), that appeared to be older than 12 years old and that showed an interest in the displays by pausing in front of the skeletons cases, as opposed to walking through the Bone Hall as a passageway. One or two researchers approached the visitor(s) and invited them to use Skin & Bones. After visitors used the app, the researcher(s) would either conduct a survey or a short interview to collect their reflections. 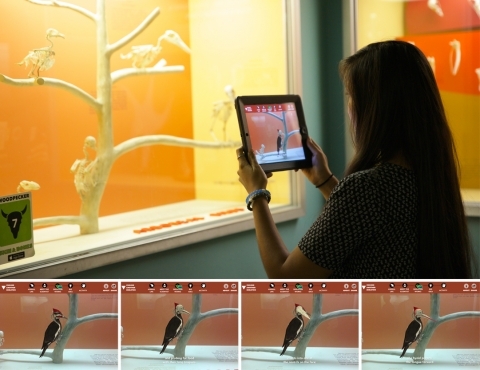 For this study, the visitors would receive a museum owned iPad with the Skin & Bones app installed. Visitors that agreed to participate were then left to explore the exhibit with the app in their own way while the researcher(s) observed and tracked their path through the Bone Hall from a distance. Once the visitors finished their visit and use of the app, they were invited to fill in the online survey or to sit and engage in a non-directed conversation with one of the researchers, prompted only by saying “tell me about it.” The approach to the interviews was open-ended and only occasionally would the researcher ask a question to explore broader themes like their previous experience with using apps, how they would compare visiting a museum exhibit with and without a tool like Skin & Bones, among others. Representative highlights are provided from visitor statements that illuminate the case for an infusion of artistically created media for communicating science. 29Most participants were unanimous in pointing out the value of using Skin & Bones while visiting the Bone Hall. In one interview a visitor said: As you’re moving through, you’re like skeleton… skeleton… another skeleton… whereas if you have this thing you can look at it more closely and see how it actually works, that keeps it more interesting, makes the exhibit better. Some recognized the benefit over just having text panels in the exhibit: It’s slow, a bit tiring if you’re always reading things so it brings in a different dynamic, using the media. 30One of the improvements to the experience was identified as the recontextualization of the skeletons: I think it’s easy to look at a bunch of bones and forget about the animal that’s underneath, or on top I guess. You can walk by and say ‘ah, that’s a cheetah, it’s much smaller than I thought’ and then [with Skin & Bones] you can get the information which I think is a lot deeper than the written part or [Skin & Bones has the] visuals to make it more real as opposed to skeletons which dissociate you from nature, from reality. Tied with a new perception and heightened awareness of the skeletons is the added knowledge about their anatomy and the animal’s ecology: When you see the teeth you don’t really think about it, but when they go into specifics talking about what it is that the teeth do to puncture the animal’s leg, () talking about the bat community, how nursing females don’t always get to go out and hunt, () that was interesting. 31The experience with Skin & Bones was considered to deepen engagement with the exhibit by some visitors: If you’re looking at something that makes you think about how it operates, or think deeper about what you’re seeing, you’re engaged and We just went through the gemstones. And with that it was just sort of ‘oh that’s cool’, ‘oh that’s nice’, ‘oh isn’t that pretty’, whereas with this () there’s more learning going on than just the visual, taking it in on the surface level. Some other visitors regarded that it can inspire imagination: What’s good about it, especially for the kids I was watching, is that it brings alive the skeleton that’s there. It’s hard () for some kids to imagine that it’s a real animal - [it has a] different dynamic that makes the animal more real for them. 32The visual experiences in Skin & Bones were referred to many times. For example: We liked that it wasn’t just a 2D flat image of the animal, that you could actually move it around or You could see the skeleton there and then to see the actual anatomy and physiology of the animal working while it’s unhinging its jaw, the muscles are releasing the venom into the prey, just kind of be able to take one of these skeletons and visualize how it works when the animal is alive. It’s neat. Also the appreciation for offering a multisensory experience: I’m a visual learner, so to be able to hear it, and then read it, and then also see it, I think it added a lot more layers of understanding. 34All audial and visual content in Skin & Bones is the result of artistic expressions of scientific ideas with minor adjustments by specialized reviewers. Despite the two first independent stages of the creative process – writing scripts and developing the audio and visual components – team collaboration happened through the revision process that encouraged improvements both in the science and in the art elements. In the balance of scientific accuracy and aesthetics, the first had priority given the goal of the project to engage visitors in science at a natural history museum exhibition. 35The two cultures were brought together in Skin & Bones and jointly they support the engagement of visitors with the scientific messages on display. Visiting the Bone Hall with the app provides a completely new experience where the rich artistic multimedia plays a central role. The audiovisuals in the form of videos, activities and augmented reality pieces make the exhibit more engaging and more accessible; the new dynamic brings focus and enables deeper thinking about the anatomical principles. The communication of science in museum exhibits can be enriched by products like Skin & Bones that stimulate children’s’ and adult’s curiosity and sense of wonder. 36The larger visitor study, within which the interviews are included, is ongoing and focusing on the use of augmented reality technology in museum exhibits. Visitors are being questioned and surveyed about the different formats of content they experience in the app and it is expected that data analysis will indicate that the engagement levels in the Bone Hall are significantly higher with the use of the app and that visitors have a more positive experience. The results of the study are expected to be informative and valuable to the museum professionals’ community, especially to those institutions interested in or that are already exploring innovative technologies and multimedia experiences. 37The authors would like to thank the other artists involved in the development of Skin & Bones: Phat Nguyen, Wei Qian, Sophia Roberts, David Schulman, and Dane Webster; Paul Sturtevant for his involvement with the interviews in the study, and Guarina Lopez-Davis, Catherine Denial, Michael McCormick, Sasha Montero and Nico Porcaro for their involvement in survey distribution. We are grateful for the valuable review of the manuscript by Prof. Dr. José Azevedo (University of Porto). The production of Skin & Bones and future research are supported by the Booz Allen Hamilton Corporation, and the co-funding of the European project POPH/FSE and a grant from the Foundation for Science and Technology (SFRH/BD/51840/2012), under the UT Austin | Portugal, CoLab. “Creative Commons.” 2014. Accessed November 7. https://creativecommons.org/. Clough, G. Wayne. 2014. Delivering on the Promise of the Digital Smithsonian. Washington: Smithsonian Institution. Elinich, Karen, and Steven L. Snyder. 2010. “Augmented Reality for Interpretive and Experiential Learning.” In Proceedings of the 2010 International Conference on Electronic Visualisation and the Arts, 87–92. British Computer Society. Gilmore, Charles W. 1941. “A History of the Division of Vertebrate Paleontology in the United States National Museum.” Proceedings of the United States National Museum vol. 90, 3109, 305–77. Washington: United States National Museum. Glinkowski, Paul, and Anne Bamford. 2009. Insight and Exchange: An Evaluation of the Wellcome Trust’s Sciart Programme. London: Wellcome Trust. Hein, Hilde S. 2000. The Museum in Transition: A Philosophical Perspective. Washington: Smithsonian Institution Press. Henson, Pamela. 2004. “A National Science and a National Museum.” Proceedings of the California Academy of Sciences 55 (Suplement I). San Francisco: 34-57. Higher Education Research Institute at UCLA. 2010. “Degrees of Success, Bachelor’s Degree Completion Rates among Initial STEM Majors”. Research Brief n.p. Kahr-Højland, Anne. 2006. “Changing Paradigms Within Museum Exhibitions: The Use of Mobile Technologies Within Semi-Formal Learning Settings.” Network of Design & Digital Heritage (NODEM) 6: 1-14. Katz, James, Wayne LaBar, and Ellen Lynch, eds. 2011. Creativity and Technology: Social Media, Mobiles and Museums. Edinburgh: MuseumsEtc. Kennedy, John Fitzgerald. 1961. Special Message to Congress on Urgent National Needs, 25 May 1961 [audio recording]. John F. Kennedy Presidential Library and Museum website Digital Identifier. http://www.jfklibrary.org/Asset-Viewer/Archives/JFKWHA-032.aspx. Pekarik, Andrew J., James B. Schreiber, Nadine Hanemann, Kelly Richmond, and Barbara Mogel. 2014. “IPOP: a Theory of Experience Preference.” Curator: The Museum Journal 57 (1): 5-27. Proctor, Nancy. 2012. “Introduction: What Is Mobile?” In Mobile Apps for Museums: the AAM Guide to Planning and Strategy, edited by Nancy Proctor, 11-20. Washington: The AAM Press. Ripley, Dillon Sidney. 1971. “The View From the Castle: Take Two Freight Cars of Specimens, Add Time and Energy-Eventually You'll Get a Natural History Museum.” Smithsonian 1 (11): 2. Schavemaker, Margriet. 2012. “Is Augmented Reality the Ultimate Museum App? Some Strategic Considerations.” In Mobile Apps for Museums: The AAM Guide to Planning and Strategy, edited by Nancy Proctor, 63–76. Washington: The AAM Press. Science and Engineering Indicators 2012. Arlington VA: National Science Foundation. Snow, Charles Percy. 1959. The Two Cultures and the Scientific Revolution. New York: Cambridge University Press. Tennessen, Tina. 2014. “When Art Meets Science: Exhibition Inspired by Bioluminescence”, Ocean Portal, Smithsonian’s National Museum of Natural History. http://ocean.si.edu/ocean-news/when-art-meets-science-exhibition-inspired-bioluminescence. The Nation's Report Card: Mega-States: An Analysis of Student Performance in the Five Most Heavily Populated States in the Nation. 2013. Washington DC: National Center for Education Statistics, Institute of Education Sciences, U.S. Department of Education. Tunnicliffe, Sue Dale, and Angela la Grange Scott. 2003. “Observations Made by Primary School Children at Skeleton Exhibits in a Natural History Museum.” Journal of Education in Museums 24: 40-44. Tunnicliffe, Sue Dale. 1998. “Skeletons-Putting the Flesh on the Bones.” The Informal Science Review 32 (1): 8-11. Wertheim, Margaret, and Christine Wertheim. 2015. Crochet Coral Reef: A Project. Los Angeles: Institute for Figuring Press. Yochelson, Ellis Leon, and Mary Jarrett. 1985. The National Museum of Natural History: 75 Years in the Natural History Building. Washington: Smithsonian Institution.